Posted on February 13, 2018 , in Hot Tubs. There are two types of hot tub owners. The first will soak in their hot tub even if there’s a cold snap and many prefer it that way. The second will swear off winter hot tubbing until the sunny warm weather returns. You have to treat your hot tub differently depending on where you live. Those living in areas with the occasional cold snap or risk of frost have different considerations and precautions needed than those that live in a northern climate. The good news is that for those of us that do live in areas with mild winters, caring for our hot tubs can be easier, however it is still important to know how to prepare for cooler weather. 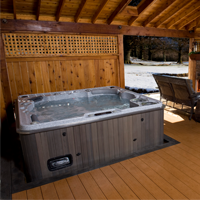 Keep reading to know exactly what you need to do to protect your hot tub during this winter’s cold snaps. First, you have to choose if you’ll keep your hot tub running in the winter. Many people love to hot tub in the winter while others would rather wait till it’s warmer. Something to keep in mind is that it does take more energy to heat the hot tub in winter but that cost can be mitigated if you have a well-insulated model. If you want to close your hot tub for the season, there are some steps you need to take. First, you must drain your hot tub completely. Any remaining water can freeze crucial parts of the tub. You should also drain the air blowers and remove the filters. To make sure no water remains, use a shopvac to blow away any leftover water. You want the inside of the tub to be completely dry. Finally, put your lockable, durable cover in place until next hot tub season. To keep your tub open in the winter, you’ll need to follow this set of instructions. First, replace the water. Before it gets too cold, especially before cold snap season, drain your hot tub, clean it thoroughly, and replace the water. If it gets too cold before you do this, you run the risk of the pipes freezing halfway through. Second, keep it covered whenever you’re not using it. A well-insulated cover will help keep the heat in if the temperature suddenly drops and keep your electricity bill manageable. You could also purchase a floating thermal blanket as an added layer of heat preservation. Third, check the water levels. In winter, the water level in your tub can drop even if you haven’t used the tub. A low water level can cause damage to the heater or pump and cause them to shut down. If they’re not working, the water could freeze and severely damage the tub. Whether you’re a polar bear hot tubber or prefer soaking in the warmth, you now know how to winterize your hot tub. To learn more about winter maintenance, download our hot tub buyer’s guide.